Plans were shifted to Alaska at the last minute after federal announcements to avoid certain Asian regions, our bags were packed, vaccinations & visas taken care of, seats booked to Delhi; bad timing. Nobody thought it would kick off but who really knows? Alaska was quickly arranged & provided a fine surrogate trip. Lots of time to admire the interior of our nylon ghetto (actually, the Expedition 36 was spacious and very weather-proof) plus a couple, two, perhaps three climbing days. Strange really, already thinking of returning for the next round of projects when just off the snow. Prior thoughts were a longing for hair free water (glaciers seem to accumulate it even after fresh snow fall? ), the niceties of being able to step out un-booted, closer proximity of sweet shops,... Must be stupid, amazingly the tent time and incessant snowfall memories quickly fade, leaving just climbing thoughts. Realistically that's about 2% of total AK time, perhaps such selective recollection is a gift?? Cameron Lawson initially accompanied Mark Synnott & I into the Ruth Gorge. The first precipitous outing involved the Eye Tooth's second ascent (according to Joe Reichart). 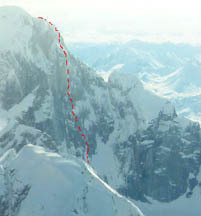 Via it's W pillar (Orgler) route (photo right). An all free line, twenty full length 60m pitches. Descent is down the route, many, many rappels. Eye Tooth's rock was mainly solid & fun to climb, good compact granite. Run-out (very little protection) 5.9-ish climbing vaguely following an arete, characterized the routes first half. Occasional bits of truly wonderful climbing interspersed with blocky or wet sections. The lower arete joins the upper headwall on a terrace, slightly steeper, still good rock. A crusty thin crack was the line I chose from the terrace; run-out, in keeping with character and around 5.10+ -ish. The routes remainder stayed similar in grade to the lower portion, though steeper, corners linked to handcracks until the angle subsided. Storms never begin when one isn't committed; ours began on the final pitch, quickly coating everything in grapple and verglass. The first ascent team placed descent anchors after their climb, luckily all were still obvious and mostly okay. The storm abated half way down. yet endless rappelling and occasional missiles freed by the ropes left Cameron unconvinced on the next (prime) objective; Mt Dickey. Instead he opted to bail, feeling the necessary images were obtained . His leaving soured the weather, granting nowt but a five day - twenty four/seven tent sit. Mark & I thought we'd be living large with the remaining "three man" food supply; but dented it heavily (ate all the tasty treats in little more than a day) during storm time. When the weather did peel back, we got up thinkin' Mt Dickey,!, but high streamers, a pressure drop and lack of tasty food had us flying back to town waiting out the next round of weather. Unfortunately we couldn't have kept enough food for climbing if tent-bound for another stormy week. More Twix acquired, plus coffee filters (essential for de-furring water) then back to snow life: Deposited by Paul Roderick's Talkeetna Air Taxi DeHaviland "Beaver"; this time right under Dickey on a side glacier ("747 Pass") of the Ruth. One hundred yards from the first pitch & the most deluxe camp-scene. Adjacent to medial moraine, we built a stone path from tent to snow free rubble, enabling casual strolls and outside time without suiting up. Doesn't sound much I know; but the ability to just step out in a glacial valley of which 99% non-snow coated surface requires a rack & cords is a true luxury. Cameron would have liked this spot; the consumption of his own Teas previously kept his tent departures frequent. Foolishly he was delegated to acquire the trip's Tea: Two herbal varieties were chosen, "Smooth Move" & "Get regular" ?! 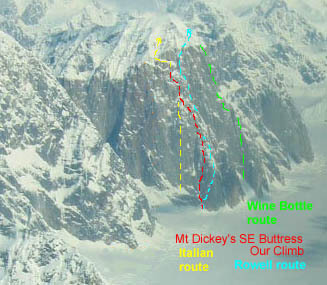 Dickey is a 5000ft wall upon which four routes have been established, all multi day affairs. Our plan was the SE buttress, via variations of Galen Rowell's route, all free. Atop the wall, just below the summit shale band was our high point before cloud engulfed and icy rain ensued. (After a lesson on Alaskan storms dealt by Eye Tooth: don't get ropes stuck, re-climbing sections on immediately verglassing rock can take hours). Luckily we took half a 6mm tag line to chop for anchors in just this scenario; unexpectedly, didn't leave the entire rack but the storm lasted a week and chomped up all our remaining time. Climbing began in the gully/chimney West of the SE buttress. Ropes from Galen Rowell, Ed Ward & David Roberts '74 ascent were seen (think they were there's?) branching right, toward the buttress' arete above the initial chimney pitch. We stayed Left-ish, following a chimney/crack system for 1000ft then branched Rightwards to the arete, via several corner-crack pitches; all good climbing on solid rock to this point. Once upon the arete/ridge we mainly simul-climbed, stopping for occasional pitches: Technically similarly graded as below though less steep, frequent buttress and towers guarded against very easy passage. These fortifications offered some of the harder pitches with some strata barely describable as rock. The Rowell route was joined on the ridge, one artefact was found; a rusty 2" angle below a 5.10 crack in the right wall of a gully. Our path followed the '74 route for 1000-ish ft at which point their crew had branched right onto an adjacent ridge via small snowy terraces above the previously mentioned 'artefact' gully. Our plan continued steering us up a buttress linking with the Italian route at its traverse terrace into the shale band. Dickey is well worth a visit plus there's several "Must do" FA's on a couple of peaks down the valley. Eleven hours to the top of Dickey's technicalities (4500ft), only a couple of 5.11 sections, mainly 5.9/10 with occasional 10+ 'boulder problems'. Hard to say how many pitches we did, simul-climbing puts distance into a different perspective. We Rappelled a more direct line leading straight into the lower chimney/crack system. Twenty six-ish 60m stretcher pitches would probably be a reasonable estimate. The kitty litter bands were the highlight, real climbing on sorta unreal rock.